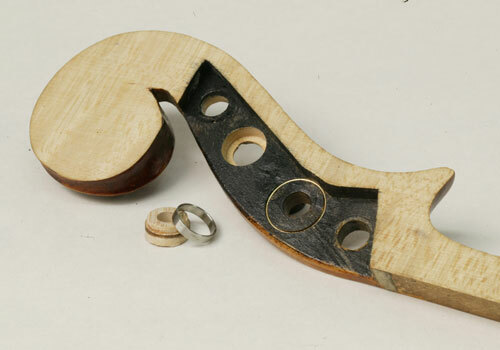 Over time, as the instrument is tuned the peg friction enlarges the peg hole diameter. 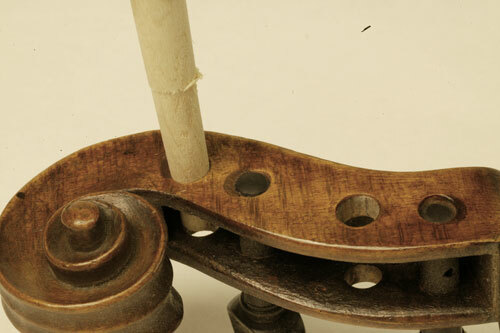 Traditionally, the peg hole is enlarged with a tapered reamer and a tapered wooden dowel is inserted and glued in place. This is visible in almost all older instruments. Most often the dowel surface visible is end grain which is structurally weaker than the wall of the pegbox. 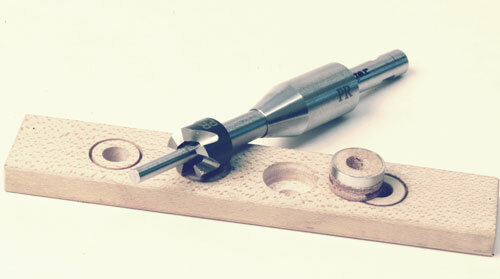 The Peg Reamer allows a flat-bottomed hole to be created, concentric with the peghole so that a wooden plug can be inserted of the same diameter. 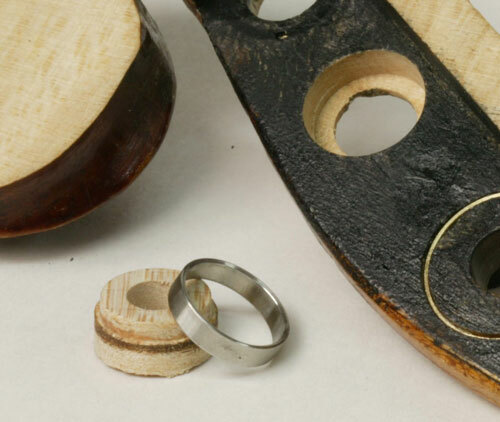 The plug is cut from a flat piece of maple with the grain running parallel to the surface. Combined with the support of a stainless steel or carbon fiber ring, this allows a new peghole of smaller diameter to be reamed without disturbing the outside of the pegbox. A very fine gap around each peg is virtually invisible, as the eye is not drawn to it. 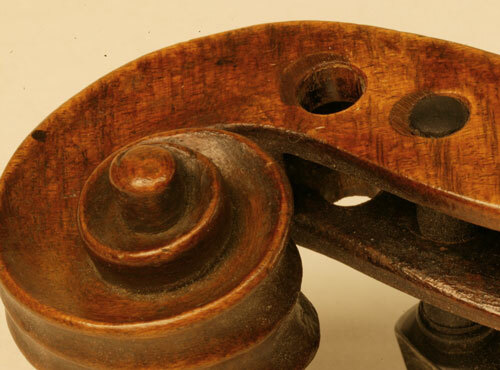 Repair of peg holes from natural compression of the wood and widening of the diameter. To reinforce and support prior repairs that may have impacted the integrity of the instrument in question. Provide strengthening and support to the end button. For proactive insertion into new instruments and/or restorations to prevent future issues arising. Compress the centering sleeves on both sides of the shaft. Turn the shaft with an electric drill to mill a 2-3 millimeter deep groove on the inside of the peg cheek, concentric to the broken peg hole. This cutter has no depth stop and the wall thickness measurement must guide the depth of penetration. A metal ring with a set screw on the driving shaft can be used to provide penetration control. Insert a prepared wooden plug and glue with a permanent glue. 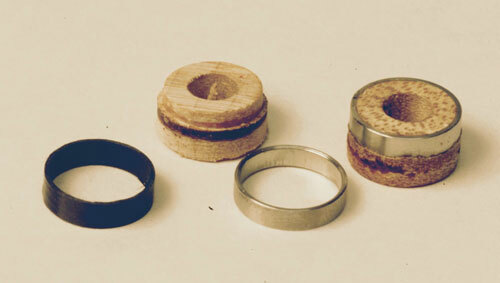 A metal or carbon fiber ring that is fitted to the plug is inserted first. Glue plug in place with a hard, permanent glue. Epoxy, Cyano acrilate and water-proof wood glues have been used. Trim the plug level with the cheek and touch-up to blend with the background. A new smaller peg hole can now be reamed into the plug.